This month, we are in focus ! 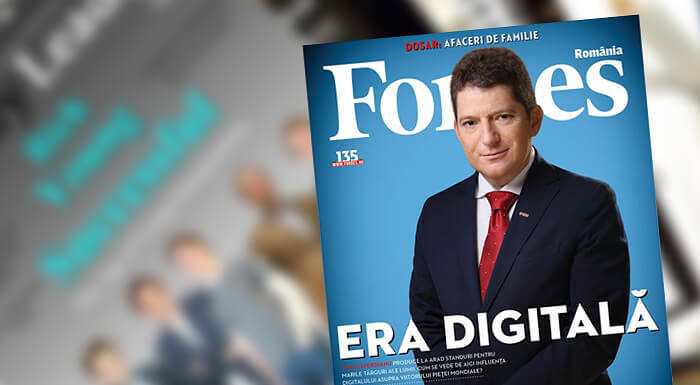 Our CEO, Voicu Sferdianu is the cover of Forbes Magazine. Discover more inside. The articles talks about past, presence and future in exhibiting industry. THE GLOBAL MARKET FOR THE EXHIBITION STANDS SUPPLIERS IS IN CONSTANT CHANGE, IMPOSED BY THE DIGITAL POPULARITY IN THE WORLD WE NOW LIVE IN. WHAT ARE THE NEW TRENDS IN THIS INDUSTRY AND HOW DOES ROMANIA MANAGE TO KEEP THE PACE WITH IT? The internet also had a major impact in the exhibition industry, as it had in all the areas of our daily lives, explains Voicu Sferdianu – owner and CEO of eXpo Design System (XDS) company and President of the International Federation of Exhibition & Event Services (IFES). IFES is a worldwide federation, established in 1984, which incorporates the major companies exhibit suppliers in the exhibition and event area, representing more than 42 countries in the whole world. „Fortunately, the digital revolution did not manage to become a substitute for the trade shows and exhibition participation. The concept of creating virtual trade shows was an experiment that really did not work well. Afterwards, trade show participation is a multi-sensorial experience. It is about emotion, which may be more difficult to be replaced by a gadget or a computer. Trade visitors want to meet the exhibitors and look them in the eyes. They want to shake hands and engage in face to face dialog with the representatives of the exhibitors they meet. They want to touch the new launched products/services displayed and to hear the explanations referring to the benefits of the products, directly from the source, a real person. But, what visitors at trade shows really enjoy, is the informal face to face component they get from the trade show experience,” Sferdianu affirms. He is one of the few Romanians that lead range international associations. Voicu Sferdianu is a Timișoara’s Polytechnic University graduate, and right after he graduated, in 1995, he got employed to Arad Chamber of Commerce and Industry, where he got his first contract with the Exhibition Industry. In 1998, he was appointed to Fairs and Exhibitions Division for CCIA. This way, he fully understood the potential this industry offered and in less than two years he left the job he had at the Chamber of Commerce. In a very short amount of time, he established eXpo Design System, a company which handles design services, construction and rental of customised exhibits, which he leads currently. „After all this time, I still love the energy and vibration of events planning and being the one who develops the set-up in major venues worldwide. There are hundreds of teams that work round the clock, that find solutions to the problems, which at times seem impossible to resolve, but they do it with smiles on their faces and with an energizing jazz that beats from the speakers covered in dust”, says Voicu Sferdianu. The company eXpo Design System has contracts with both Romanian and international companies, and it has worked over the years on projects for many National Pavilions. „We built frequently the National Pavilions of Germany, Egypt and The United Arad Emirates, but we have never built a Pavilion for Romania”, says the XDS director. Recently, he was appointed the IFES international association President. From this position, he says he will try as much as he can, to promote and to help the Romanian exhibit industry. Beyond the challenges, Romania is often affected by factors related to the international context and the world of business we all now live in. The IFES President says that, for years, he has made considerable efforts to change the international partners perceptions and relationships. He points out that all the Romanian exhibit supplier and service companies should have unrestricted access to new business opportunities related to exhibition stands construction in Europe, according to the rules. There can be an excellent opportunity for growth in Romania. However, the global data shows that, the world trade shows industry has been in continued growth, for the past ten years. As the dates for this year, about 7 from 10 companies that will be active in this exhibition field, appreciate they will record significant increases in revenue, according to the Global Exhibition barometer report, concluded by UFI. For the next year, the largest increases are expected to take place in The United States, where 8 from 10 companies estimate a business increase, and the worst expectations come from Eastern Europe, especially Russia, where only 5 from 10 companies will increase their trade show business from this field, and believe that they will record increases in the next period. Related to the trends which will influence the industry, Sferdianu is convinced that after the economic crisis of the previous years, the financial situation of these companies is expected to improve. Most companies, firmly believe that trade show marketing will increase their business opportunities due in part to the power of face to face communication. „From this economic recovery, most companies will be more willing to invest in their marketing efforts, and in process improvements. Therefore, this is an opportunity, even for us, the exhibition stands constructors, to create partnerships with these local and international companies and to focus our efforts to provide the exhibiting customers a higher level of perception and confidence in the power of trade show marketing in Romania, or any other international location”, says Voicu Sferdianu. Voicu Sferdianu made a selection of the most famous succesful trade industries and exhibitions that are periodically organized worldwide. Technology prevails in the rankings. Hannover Messe – organized by Deutsche Messe at Hannover, is one of the largest trade events for industry and dedicated to technology in the world. This trade event manages to gather for a few days over 5.000 exhibitors and to attract over 180.000 visitors, from more than 100 countries. CES – Consumer Electronics Show it is organized in Las Vegas in January, each year. In 2014, there were 3.290 exhibitors on a 178.000 square meters surface and attracted over 100.000 visitors from around the world. Singapore Airshow – is the largest trade event for the aerospace and defense industry, organized in Asia. IFA Berlin – is a famous trade event, mostly because people attend from around the globe and anxiously await the launch of new gadgets, during IFA. The first edition was organized in 1924 and by then it managed to maintain a continued succes rate. „Trade show marketing continues to grow in popularity and success for global companies. My hope is to fan the fire trade show growth in Romania and to expand our services worldwide”, says Voicu Sferdianu.